The sun shined bright above the desert sky at HITS Desert Horse Park as the crowd gathered to watch the $100,000 Longines FEI World Cup™ Qualifier on Saturday, February 11. The competition served as the grand finale of the Longines FEI World Cup™ Jumping Thermal event during week IV of the HITS Coachella Desert Circuit. An impressive lineup of horses and riders from around the globe gathered to jump for the final West Coast qualifying opportunity and a $100,000 prize purse. As the last stop for qualifiers on the West Coast commenced, riders were hungry for the opportunity to qualify for the Longines FEI World Cup™ Jumping Final to be held in Omaha, Nebraska, on March 29 –April 2. USA equestrian Ashlee Bond would go home with the coveted, velvet blue Longines sash and a beautiful Longines watch as the winner of Saturday’s competition. Perhaps the most important sentiment to Bond, though, was the meaning behind the win with her trusted partner, Chela LS, owned by Little Valley Farms. Two of the top four finishers will be paying a visit to the FEI World Cup™ Jumping Finals in Omaha: second place finisher Audrey Coulter and fourth-place Karl Cook. Third-place went to Lane Clarke, an Australian equestrian. The top three finishers are veterans to HITS shows and returned to the place they have all once called home throughout their riding careers. Brazilian course designer, Marina Azevedo, set a course that created excitement for spectators in the stands and challenged the skill of each horse and rider. The course of 16-jumping efforts which would ultimately separate four riders from the talented field for the jump-off. Bond put in a very impressive ride in the competition, going first in the first-round as well as first to return to contest the jump-off course. The jump-off consisted of eight fences, and was winding and technical, including a bending line to an oxer that caught up a few of the challengers— but Bond and Chela LS remained resilient. Following Bond was Australian rider, Lane Clarke riding Balu U. After a second-place finish in the $36,500 Desert Welcome Stake to begin the event on Thursday, Clarke returned to the Grand Prix Ring to once again capture a prestigious top five finish, this time in third place. Clarke and Balu U, owned by Georgy Maskrey-Segesman, powered through the course, ultimately picking up eight faults in 40.10. Next to challenge the abbreviated course was Karl Cook, also from the USA. Cook rode Tembla, owned by Signe Ostby to an eight-fault ride in 41.05. They looked to go clear until a mid-course vertical and the final fence foiled their shot at the lead. 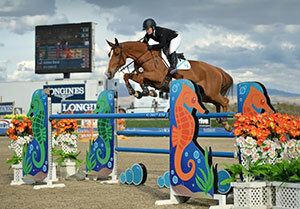 They would settle for the fourth-place title, but would walk away with a qualifying ticket to the FEI World Cup Finals. The final contestant was Audrey Coulter and Alex, owned by Copernicus Stables, LLC. They took each fence by storm until a difficult take-off distance cost them a rail. They would finish the course strong in 45.29. The exciting FEI World Cup™ Finals will commence on U.S. soil in Omaha, Nebraska, March 29–April 2. Who will lay claim to the champion title? Only time will tell.